Urban Creep Fabric Design , Oh My! I was thrilled to get my cuts of my design, Urban Creep, in the Urban Textures Fabrics Collection from Andover Fabrics. I made a sample quilt for them to take to market. I also had to write instructions and that was not really easy. I don’t know Electric Quilt and I tried . I really tried. So the instructions are what I would use if I was giving a workshop on the quilt. It is more of a plan than an actual pattern. The fabric is so unique that many quilts out of the fabric using the plan would not look alike. 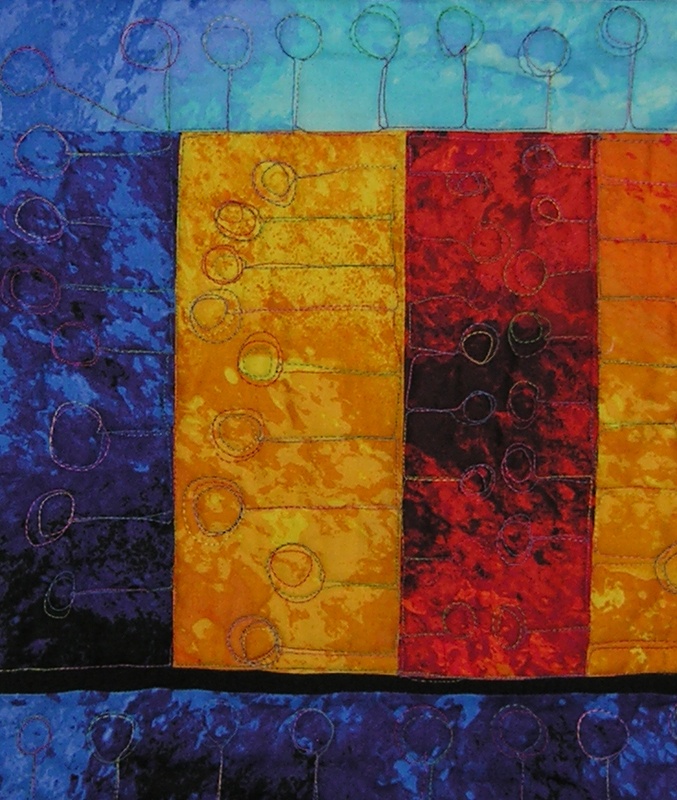 Here is a close up of one section of the quilt. The yellow and red are from the same fabric so you can see some of the color shifts and how versatile each color way can be. I used a design from Leah Day to quilt the piece with a modern motif. That finished fabulously…color, texture, comp…well done!